Reading selfish love quotes, Quotes About Selfish Love and saying! "I&apos;m selfish. I want you all to myself"
1. Love is the most selfish of all the passions. 2. My love is selfish, I cannot breathe without you. 3. 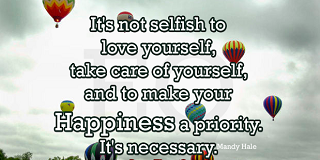 It is not selfish to love yourself, take care of yourself and to make your happiness a priority. It&apos;s necessary. 4. No more distractions no one else matters, I love you and you won&apos;t believe how selfish I am going to believe. 5. Call me greedy, call me selfish, but I don&apos;t want anyone else to hold your hand. I love You. 6. I am selfish, impatient and a little insecure. I make mistakes, I am out of control and at times hard to handle. But if you can&apos;t handle me at my worst, then you sure as hell don&apos;t deserve me at my best. 7. It is okay to be selfish, because some people in our lives need to be ours and only ours. Fight, love and work hard for them, but never let them go. You are one of those people I selfishly need and want for myself. 8. Taking care of you is the most selfish thing I will do for myself, because a happy you is a happy me. 9. I love you so much that nothing can matter to me - not even you... Only my love - not your answer. Not even your indifference. 10. 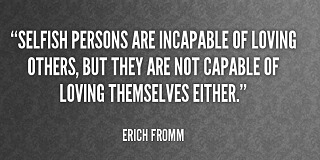 Selfish persons are incapable of loving others, but they are not capable of loving themselves either. 11. I&apos;m selfish. I want you all to myself. 12. True love is sacrifice. Love is thinking about others before you think about yourself. 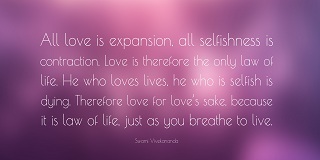 Love is selfless, not selfish. 13. 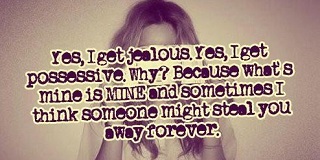 Yes, I am selfish because I don&apos;t want to share you with others. 14. We cannot love ourselves unless we love others, and we cannot love others unless we love ourselves. But a selfish love of ourselves makes us incapable of loving others. 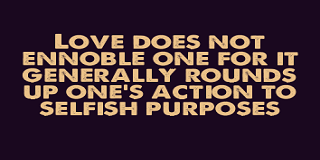 Let&apos;s read selfish love quotes, Quotes About Selfish Love and saying for you. See more and feel!